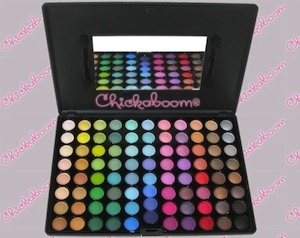 A new site I had never heard of before contacted us today to tell us about a promotion they are having, the site is called Chickaboom and they are a Canadian site selling makup and accessories online. Their promotion is for free shipping with the code below. Now having not shopped there before and the site not being around long enough to gather a reputation I am looking for someone to tell me their shopping experience of the site, did they ship on time, did you get the product you were after, were you happy? Please let us all know, as you know we have to be careful with new sites. They are currently featuring free shipping on their 2 top-selling products, the b88m matte and b88m shimmer eyeshadow palettes with promo code “CBSHIP“. They are also featuring a contest on their Facebook Fan Page where fans are invited to submit their “Green Inspired Eye Looks”, their theme for November, to win great prizes. To visit the site you can go to www.chickaboom.ca.